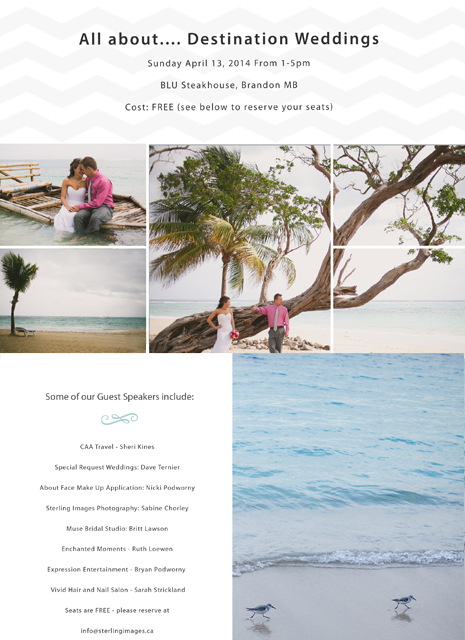 Posted by Dave Ternier - April 7, 2014 - All About Destination Weddings, Always Learning! An increasingly popular trend these days, is the idea that getting away to some hot & exotic location with your closest friends & family for your wedding is the *perfect* stress free way to get hitched AND enjoy a vacation at the same time! While much of that is certainly easier (depending on how involved you want, or can be), there are often many questions about what to do, how, when & why. To help with that, some really fantastic people are getting together to discuss their past experiences and thoughts for those thinking about (or have already made up their mind about) a Destination Wedding. Sabine Chorley of Sterling Images came up with the idea of having an information session strictly on the ins and outs of destination weddings, but from a multi-vendor point of view. As a frequent traveller for the purpose of numerous destination weddings annually, Sabine has experienced it all! I came on to help co-organize the event with her as she’d requested some of the insight I learned while working as the Master of Ceremonies & Disc Jockey for Courtney & Taigan’s December 2012 wedding. Additionally, with the thought that I’d like to pursue more weddings abroad, I thought this might be a good fit for me! For the cost of it — yes, it’s FREE! — these couple of hours will be worth an awful look you. We have on board not only Sabine from Sterling Images, but Britt from Muse Bridal Studio, Sheri from CAA Travel Manitoba, Nicki from About Face Makeup Application, Ruth from Enchanted Moments Invitations & Cards, Bryan from Expressions Entertainment, Sarah from VIVID Hair & Nail Salon as well as a few more surprises that you’ll just have to come out for! I’ll also be sharing some of the unique details that I’ve helped create for weddings in the past. Come and be inspired! To host this fun event, we’re very excited to be using the beautiful private dining room space at Brandon’s hottest new culinary escape, Blü Kitchen & Bar. Special thanks to the fantastic staff there for providing us with some tasty apps for enjoying while we discuss everything about Destination Weddings! Maybe you’re still waiting to make up your mind if a Destination Weddings is the right decision for you or maybe you have things booked already and simply want some more ideas and perspectives. Bring your questions, concerns and requests for help and we’ll do what we can to put your mind at ease. Looking forward to seeing everyone and because it is happening THIS Sunday, April 13, 2014, don’t forget to RSVP ASAP!